If you own one of the fine Cruisers Yachts line of boats, then you know how proper maintenance can extend the life of the craft. This is true of the inside as well as the outside of your boat. One way to help maintain the integrity of the inside is by using custom boat covers that are designed to fit the unique shape of your boat so that you can minimize maintenance and maximize the life of the vulnerable materials that are inside your boat. 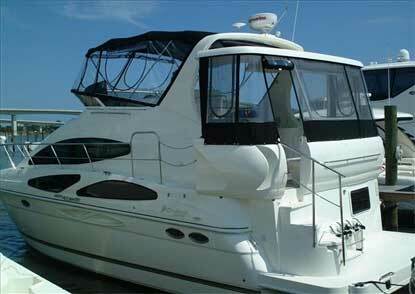 Cruisers Yachts boat covers are always a great investment for a big part of your life! Boat tops are designed to protect your craft from the sun, the elements and dirt and debris that may collect inside your craft over the time it is not in use. The tough marine canvas used by Chicago Marine Canvas is durable and long lasting so that there are fewer boat canvas repairs which need to be made. 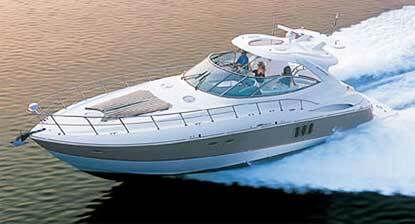 What are Custom Cruisers Yachts Boat Covers? These are boat tops or covers that precisely fit your craft. They are actually measured so that they fit the contours of your Cruisers Yachts boat for the best possible fit to keep out the water, dirt and debris that otherwise might build up over time inside your boat. In addition, they are made from tough, durable marine canvas materials so that they will last for a long time in protecting the inside of your boat. Custom covers are not uncommon and in fact are recommended by many boat manufacturers as one of the best ways to protect your craft when it is not in use, but is exposed to the sun and the elements. Why Choose Custom Boat Tops? There are a number of reasons why you should consider getting a custom boat cover for your craft, particularly over the many different types of generic covers that are on the market. While a generic cover is less expensive to purchase, it may not save you on the long term costs of protecting your boat. Tight Fit: A custom cover will tightly fit the top of your boat so that the least amount of water, dirt and debris will enter. Compare this to a generic cover which does not fit the top of your boat very well allows more of what you do not want inside your craft. Storage: One of the reasons not to get a generic covering is that it may be difficult to store either on the boat, in the vehicle or a nearby storage area. This is especially true if it is noticeably larger than the space it is required to cover. Compare that to a custom fit version which takes up as little room as possible, thus making it easier to store. Materials: Many generic covers are made from standard canvas which is a good, but hardly exceptional material that will last for a few years before it needs to be replaced. Compare that to a custom fit cover that uses marine canvas which may go for a decade or more in covering your craft while needing fewer boat canvas repairs. In the long run, using custom boat covers will help you save money over a standard, cheap generic covering when it comes to protecting your boat.